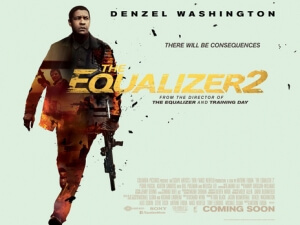 The Equalizer 2 marks the first sequel of not just director Antoine Fuqua’s career, but also lead actor Denzel Washington’s career, although you have to question why they decided on this film to be the first follow-ups they’ve ever done, given how underwhelming the end results are. Fuqua’s 2014 big-screen reboot of the classic Edward Woodward television series of the same name didn’t exactly leave the biggest impact upon release; though the inclusion of a powerhouse actor like Washington in the lead role added some gravitas to the proceedings, the rest of the movie was a pretty generic, slow-paced and overall not memorable enough to last within the subconscious. I had to go back and re-read my review for the first one just so I could remember certain things about it, because I sure as hell didn’t remember anything from the one and only time I ever saw it. This movie, however, I’ll have an even harder time remembering should they ever make a third one, because so much of it is made up of stuff that’s been done so many times that there is nearly nothing that stands out about it, and the things that they do try and bring to the table, from the graphic violence to the overly intense action sequences, aren’t interesting enough to really set itself apart from many other films like it. You’ll be a lot more bored by this movie than you will be genuinely entertained, and it doesn’t even have the decency to be fun either. Washington reprises his role as Robert McCall, a lowly vigilante who exacts justice on those that have done wrong in society; here, he’s taken up the position of a Lyft driver to pass the time, which every now and then also gives him rotten people to teach a lesson, like wealthy businessmen who have abused a young intern. McCall’s lonely and quiet existence is shattered, however, when his friend Susan (Melissa Leo) is killed whilst investigating an apparent murder-suicide in Brussels, and he goes on the warpath to find the mercenaries who are responsible and bring them to his own definition of justice, on a mission that also sees him reunite with former military buddy Dave (Pedro Pascal), who is now a DIA operative who worked with Susan in Brussels. It fits right alongside the first one in the sense that it’s overwhelmingly generic; again, you have seen this kind of plot before many times, with the retired Special Forces person being called back into action following the death of a close friend or family member, said protagonist bonding with a local neighbourhood kid who may or may not be going down a criminal path – this one being played by Ashton Sanders from Moonlight – and the villain turning out to be someone that they thought could trust. If that last part was a spoiler, it shouldn’t be; you can tell this person is a little shady right away from their first scene, and when the film does eventually get to that reveal you’ll have cracked it long before Denzel has. It’s a script that lacks any real surprises or levels of excitement, and it fails to write the characters or plot points in ways that at all interesting or intriguing enough to hold your attention, leaving you fighting off boredom whilst Denzel Washington fights off bad guys in this dull, stock, occasionally stylish action-thriller with very little action or thrills. The movie feels a lot more uninteresting because Fuqua has once again given it a pacing that even snails would complain to be too slow. This isn’t even that long of a movie, clocking in at just over two hours, but it feels a lot longer because Fuqua pads it out with unnecessary filler and characters with entire sub-plots that could have easily been cut out entirely. There’s a sub-plot, for example, where Denzel’s character befriends an elderly Holocaust survivor who is looking for a painting of his missing sister; it can be touching at times, but there’s really no reason for it to be in this cut of the movie as it doesn’t impact the narrative in any way shape or form, it doesn’t come back as an important plot point in any way, and it’s spliced in to the movie as though they forgot to take it out and then restore it for a DVD-only extended cut. I’ve noticed in a lot of recent Fuqua movies that he likes to pad things out to a point where the pacing can become tedious and so slow that you’re just impatiently waiting for it to get to the point; both of his Equalizer movies are no different, but they – more noticeably with this one than the other one – aren’t even entertaining enough to hold your attention throughout most of the overstuffed claptrap that’s unfolding on the screen. There are a couple of good things I can say about it; for one, Denzel Washington is really good in this, but you kind of already knew that he’d turn in a solid performance regardless of the quality of film he’s in, so that shouldn’t be too much of a surprise; and while most of the action is pretty uninteresting and dull to look at, there are a couple of sequences that work if only for the sudden over-the-top nature to them in an otherwise straight-faced movie (there’s a fight between Denzel and an assassin in a car that marks the biggest moment of actual fun in this movie, and the climax earns a couple of points for ambition due to setting it in the middle of a hurricane). Largely, however, this is a bit of a wasted opportunity for both Fuqua and Washington, especially seeing how this is their first sequel in their respective careers; maybe they should have shopped around for a better one before deciding on this one, that way there’d be at least a solid reason for them to do a sequel. The Equalizer 2 is a mostly dull, generic and very unengaging action-thriller sequel that is more boring than exciting, and wastes a decent lead performance by Denzel Washington thanks to its snail-paced plotting and unoriginal script.